Protects up to 2.4 hectares (24,000m2). Includes four (4) built-in amplifiers and four (4) external speakers (each with a 30 m cable). 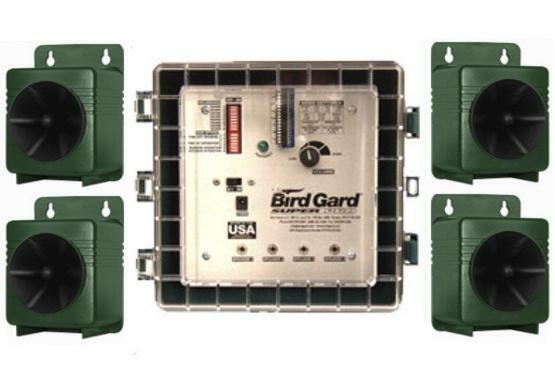 The electronics unit is mounted in a weather-resistant control unit and works in any kind of weather. The device has a chip that is designed for repelling a certain bird species. A variety of extra chips can also be purchased (EUR 50/piece), and they are very easy to change. The power adapter is 1.5 m long and the set also has 12V battery clamp cables. The device can be differently programmed. For example, you can choose different combinations of sounds that are generated, and it is possible to choose the day or the 24-hour mode. For example, it is possible to set the device to make a random sound during a random time period from a randomly selected speaker. Randomness is precisely what many birds are afraid of. When ordering, please send a separate email detailing which card you want to buy the unit with. 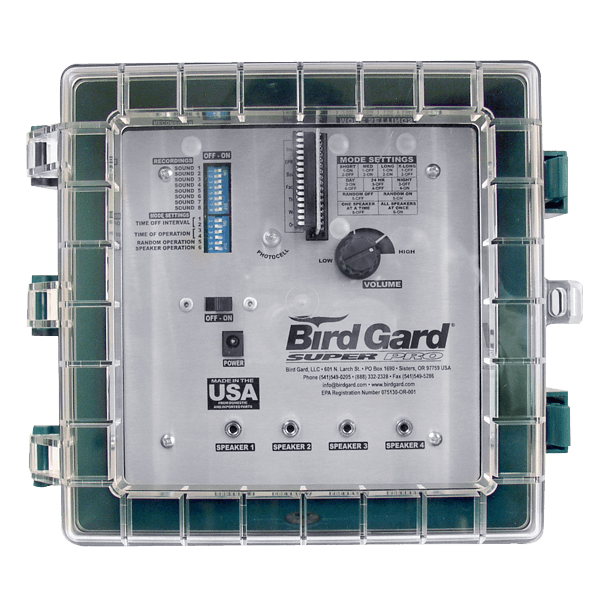 Bird Gard Super Pro is safe, humane, and environmentally friendly.